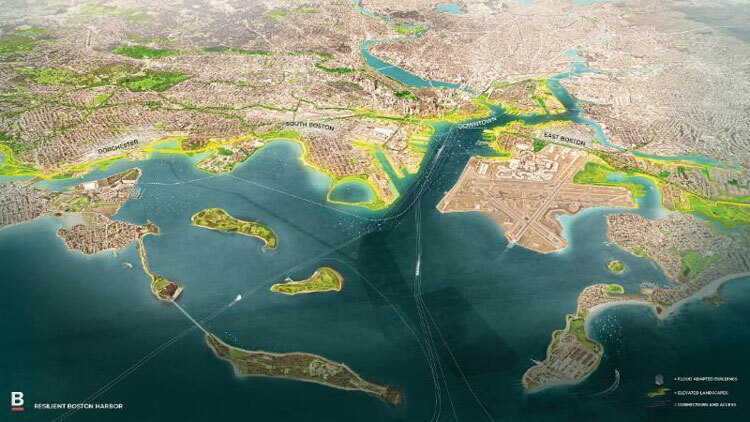 Boston — Boston Mayor Martin J. Walsh rolled out a comprehensive and transformative vision that will invest in Boston’s waterfront to protect the city’s residents, homes, jobs, and infrastructure against the impacts of rising sea level and climate change. Announced in his annual speech to the Greater Boston Chamber of Commerce, the mayor’s plan, “Resilient Boston Harbor,” lays out strategies along Boston’s 47-mile shoreline that will increase access and open space along the waterfront while better protecting the city during a major flooding event. Transform the parking lot at Sargent’s Wharf into a combination of open space and resilient small-scale development. An elevated New Ellery Street along the Dorchester Avenue corridor in South Boston, as identified in the BPDA’s PLAN: Dorchester Avenue South Boston to provide additional flood protection for South Boston’s residential neighborhoods. Complete Martin’s Park, an inclusive waterfront playground that will be climate-ready. Became one of the first cities to set a target of carbon neutrality by 2050. This week, the City released a Request for Proposals (RFP) for the next update to Boston’s Climate Action Plan that will create a roadmap for that goal. Today, Boston is the top-ranked city for energy policy by the American Council for an Energy Efficient Economy, and rating agencies cite Boston’s climate work in support of the City’s triple-A bond ratings. The projects outlined in Resilient Boston Harbor will require a number of different funding sources. Mayor Walsh announced that the City of Boston will commit 10 percent of all new capital funding to resilience projects. He called on Boston’s state and federal government partners, as well as the private sector and non-profit and philanthropic stakeholders to join the City in committing to make these necessary investments a reality. The strategy builds on the City of Boston’s Resilience Strategy. Boston’s resilience strategy is focused on ensuring every resident can reach their full potential regardless of their background, and removing the barriers of systemic racism that hinder Bostonians from having access to opportunities.